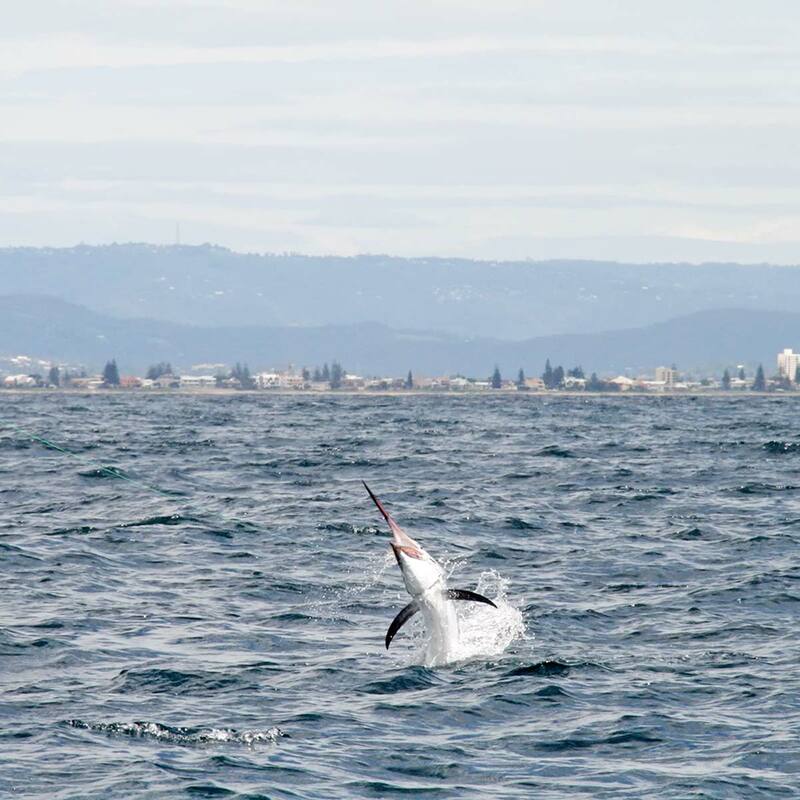 The skyline of the Gold Coast is very familiar, and the light tackle grounds can offer a perfect vantage point as well as an awesome day on the water at this time of year when the juvenile black marlin make their way to the waters of the Gold Coast. When summer arrives the warmer currents are moving into, and along, the coast from SE Queensland down to and as far south as southern NSW. With the current comes the summer run of juvenile black marlin. These little fellas are a ball to catch on light tackle and to be completely honest aren’t that hard to catch. 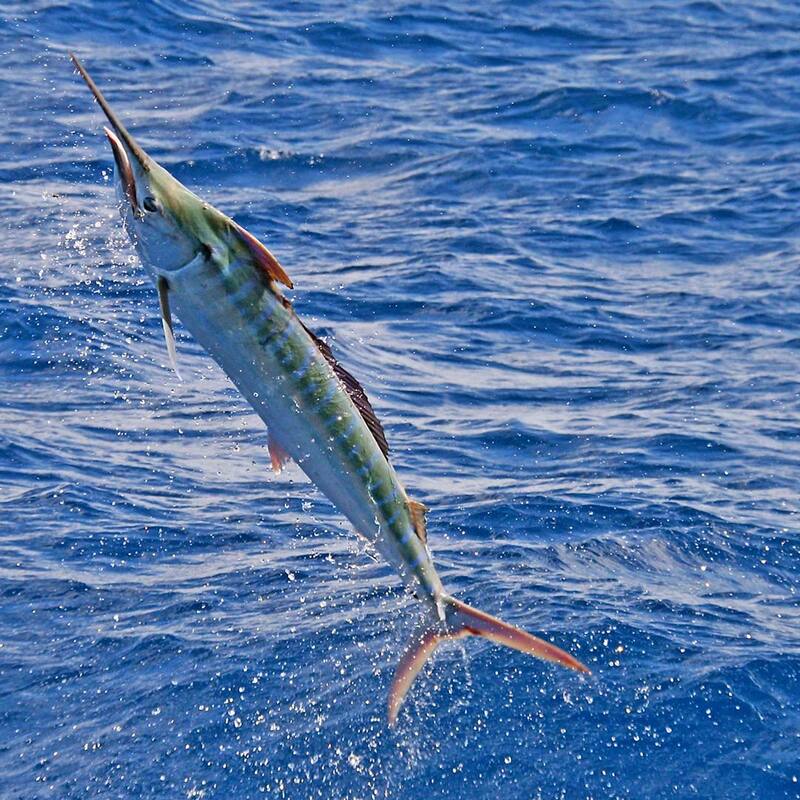 Trolling small marlin lures is by far the easiest way to catch them for the inexperienced, and if you’re also out there to catch a feed, mahi mahi, wahoo, tuna and mackerel will be more then happy to gobble them up as well. Trolling dead and live bait and switch baiting are other successful methods on these juvenile fish. The beauty about fishing in SE Qld is the close proximity of the 30m line. In short, this is the line where the ocean depth deepens to 30m. We use this as a rough guide all along the entire east coast as a good starting point when trolling for these fish. Off the Gold Coast, the 30m line comes in as close as a 1.5NM east of the Southport Seaway, making it ideal for trailer boats and big boats alike after a short travel time or trying to save on fuel. One year we headed out first thing in the morning and managed to catch 3 marlin and still get back by late morning in time to get the Christmas shopping done! It’s not about GPS marks! You won’t find marks here, rather we want to give you an understanding of what to look for, which can be duplicated all the way up and down the coast. This map shows the 30m line (green) and was created using the Navionics app which we use on and off the boat all the time. Food is the driving the factor of the juvenile marlin. As far as we know, these fish start their lives the preceding October-December the year as spawn of the giant black marlin on the Great Barrier Reef. From April to October they are at a catch-able size, starting sub 10kg. After eating their way through FNQ, the fish make their way south to end up on the Gold Coast and arrive anytime from late November, some 14 months or so after ‘birth’. They are growing fast and are hungry most of the time. 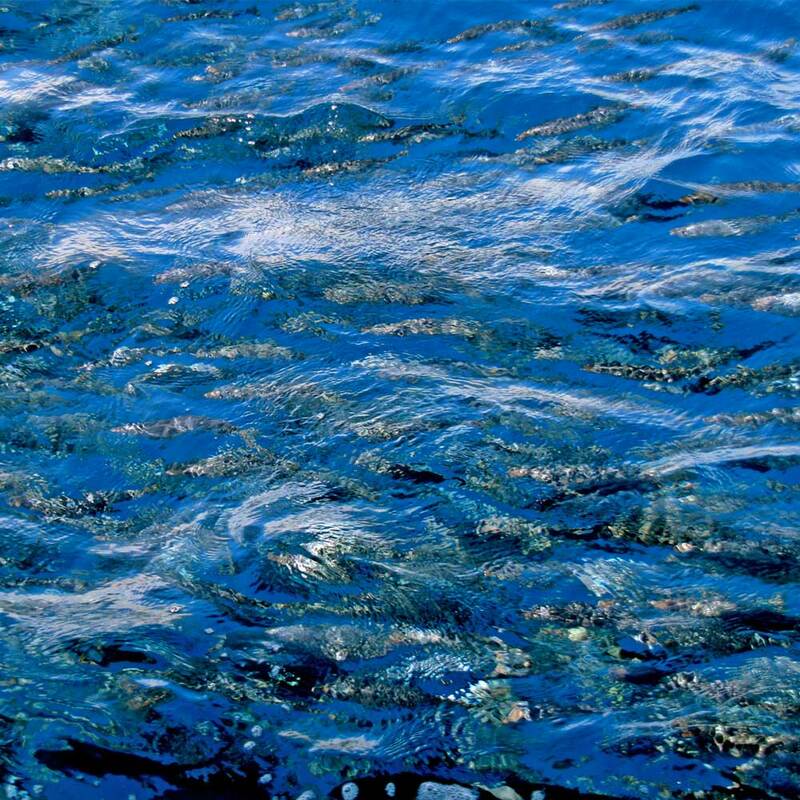 And it is the huge schools of baitfish that gather roughly along the 30m line, give or take – sometimes a little deeper, sometimes shallower (generally in area away from the strong current and rich in food for them (the baitfish) to thrive also) – that attracts them. Like all fish, find the bait find find the fish. The bait: The large, sometimes bigger then football field schools of baitfish mainly consist of, yakkas, slimie mackerel, whitebait, herring and pilchards. Dropping a bait jig down on these schools is the best way to catch your live bait, although on the Gold Coast its not always that easy. Small slimie mackerel, whitebait, and pilchards make up the majority of these inshore bait schools in the Gold Coast area, and are often too small or just won’t eat a bait jig. So, if you plan to use live bait you will have to catch it first on the bait grounds. Often there is more bait than marlin to eat it. So some bait schools have marlin feeding on them and some don’t. This is where your depth sounder comes into play. Depth sounders or fish finders have really advanced of late and their ability to give you accurate precise information is nothing short of amazing. 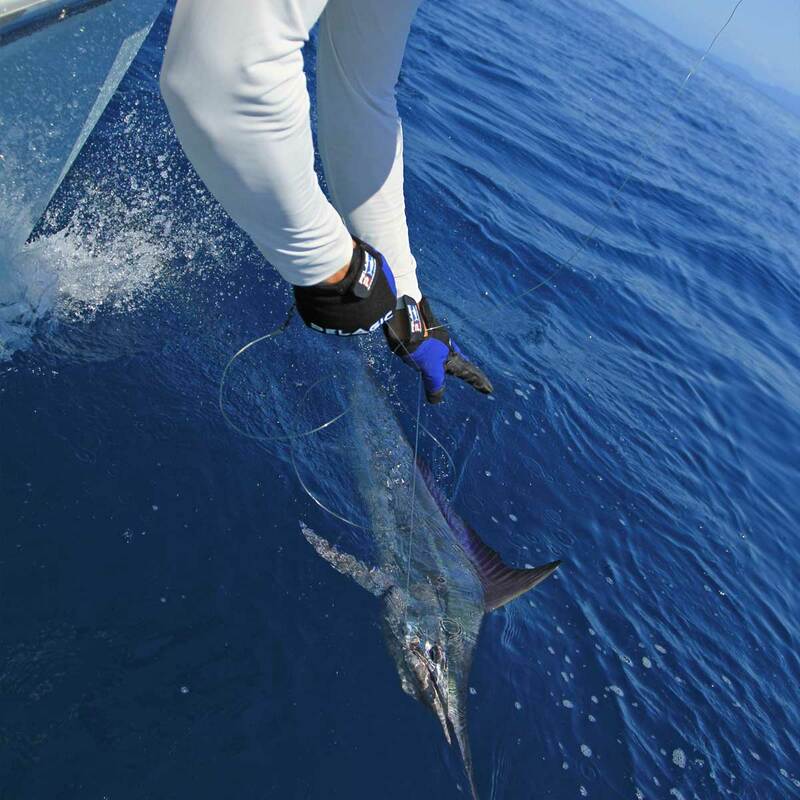 They can easily mark marlin in the area and marlin feeding on the bait. Marlin normally show up as boomerang or solid ball shape on your device. Another good way to tell if there is marlin on the school is its shape and density. Schools marking on your sounds as dense solid balls or columns rising from the bottom, or schools with straight edges are dead set signs marlin or other pelagics are feeding below. On the contrary bait schools that mark as scattered blue/green or thin layer on the bottom, generally indicate not much is going on …… yet. From the Southport seaway north to Point Lookout ,and south to Coolangatta, hungry little black marlin can be abundant in the summer months. To the north: 30m line is only a short 5 minute run before you can put your lures or baits out. You can fish your way north looking for bait schools all the way up to Jumpinpin. The area off the water tower on south Straddie is a good spot as is to the north of that all the way to east of Jumpinpin Bar. The nutrients and water movement flowing in and out of the bar provides a haven for baitfish and this is where you will find the really big schools. The area just south of Point Lookout is another good place to look. Here the deeper water comes in very close to the beach and its not uncommon to catch marlin within site of people swimming. 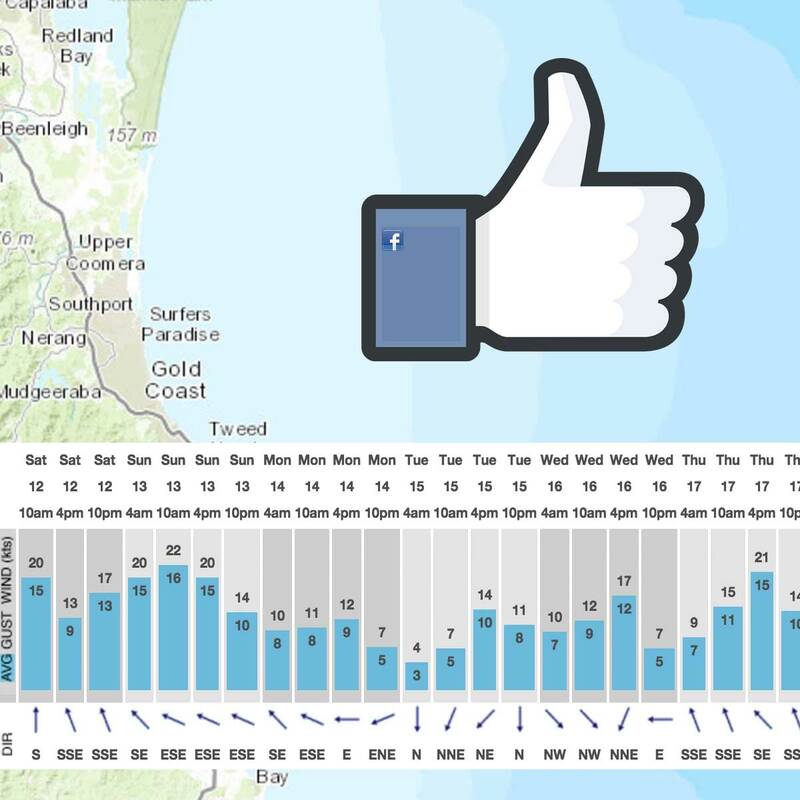 To the south: Off the Southport seaway fishing the 30m line all the way to Coolangatta you will run into bait schools and marlin – although the area off Q1, Mermaid beach and Burleigh heads has been the most productive. So which way do we go, north or south? Weather can also play a part in the decision making process. Use the forecast to your advantage. Generally the wind is calmer in the early morning, so if the forecast is for a NE coming up in the afternoon then run up and fish to the north, this way you will have the breeze behind you on the way home. Vice versa if the they are saying SE, then try south for the same reason. Jumpinin Bar can be crossed and it is a very short run out from there to start fishing but, without local knowledge I would stick with just the Seaway to be safe. 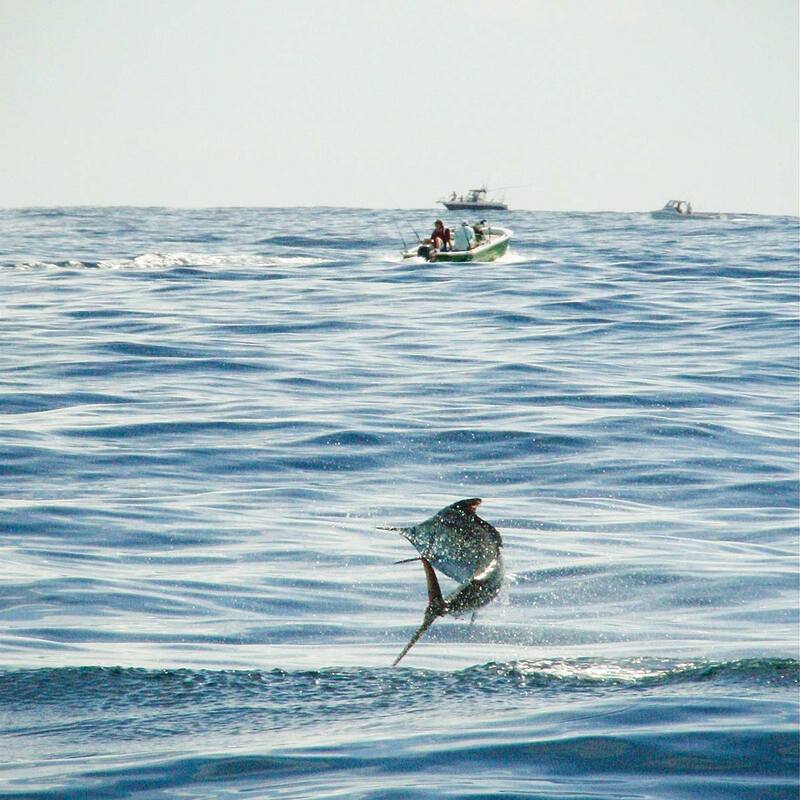 One thing we do ask is to please take care of the marlin you catch and try to cause as little amount of stress to the fish when you are releasing it. Take care of yourself as well – little bill can cause some damage if mishandled. Always make sure to hold the bill as close to its mouth as possible so you don’t snap the bill off and make sure the fish is always pointing away from you. While not encouraged, if you must lift the fish out of the water for a photo be sure to support it is fully and have cameras at the ready. Be as quick as possible gently lower the fish back in the water and swim him – hold the fish underwater fully in the horizonal but correctly upright position by his bill and slowly motor ahead to get the water flowing through the gills. The colour should come back into the fish the same as it looked when he was jumping during the fight. It might even bite down on your hand, a good indicators it’s healthy and ready for release.